Microsoft is betting on making sci-fi combat game 'Titanfall' a hit big enough to boost sales of its Xbox One videogame device. Microsoft Corp is betting on making sci-fi combat game 'Titanfall' a hit big enough to boost sales of its Xbox One videogame device, helping it catch up in terms of sales with rival Sony Corp's PlayStation 4 console. On sale from Tuesday exclusively for the Xbox One and personal computers, the $60 game allows players to go toe-to-toe as soldiers, or take control of giant robots in a war-torn urban setting. Retailers are gearing up to get in on the buzz that has built up around the release of the game, one of the most anticipated new products for the latest version of the Xbox, by hosting over 6,000 midnight launch events worldwide. "We're making a big bet that 'Titanfall' is going to be a blockbuster launch for Xbox," Yusuf Mehdi, head of marketing and strategy for Microsoft's Xbox group, said in an email interview. As part of its 'Titanfall' campaign, Microsoft will also promote the game at South by Southwest, the annual gathering of tech industry experts, filmmakers and musicians now under way in Austin, Texas. Developed by Respawn Entertainment and published by Electronic Arts, the game will be made available for the older Xbox 360 consoles on March 25. With the launch of 'Titanfall' much anticipated, the games industry is watching to see if the title can replicate the 'Halo' effect. Released exclusively for the Xbox back in 2001, 'Halo' - another sci-fi shooter game - became a blockbuster franchise, fuelling sales of Xbox consoles. "We don't have a sales forecast for the game to share, but we expect it to be big for us," Mehdi said. Microsoft is locked in a console battle with Japan's Sony, which announced last week it had sold 6 million PlayStation 4 units as of March 2. The device beat the Xbox One to become the top-selling console in the United States in January, according to market research firm NPD Group. Both the Xbox One and PlayStation 4 launched in November last year. Microsoft has not provided an update on sales since January, when it said Xbox One sales crossed three million units as of the end of 2013. 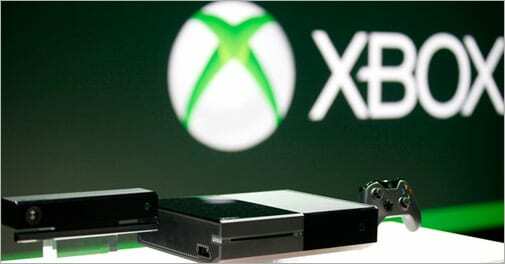 Priced $100 more than the $399 PlayStation 4, the Xbox One is seemingly trailing behind in sales. In February, Microsoft announced an Xbox One and 'Titanfall' bundle for $499, effectively offering the game for free.